Offering in-depth analyses of current theories and approaches related to Sobolev-type equations and systems, this reference is the first to introduce a classification of equations and systems not solvable with respect to the highest order derivative, and it studies boundary value problems for these classes of equations. Presenting 2200 equations, this volume studies specific partial differential equations for applications in mechanics, physics, hydrodynamics, and oceanography and presents previously unpublished results, solvability theorems, and research. It includes mathematical results from S.L. Sobolev's study on the small oscillations of a rotating fluid and more. 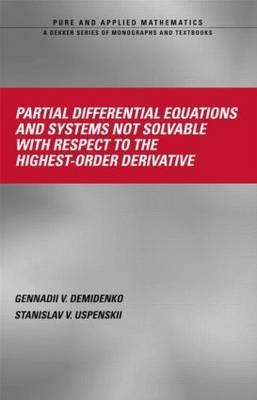 Preliminaries the Cauchy problem for equations not solved relative to the higher-order derivative; the Cauchy problem for non-Cauchy-Kovalevskaya type systems; mixed problems in the quarter of the space; qualitative properties of solutions toSobolev-type equations. Appendices: S.L. Sobolev - on a new problem in mathematical physics; bibliographic comments; literature.